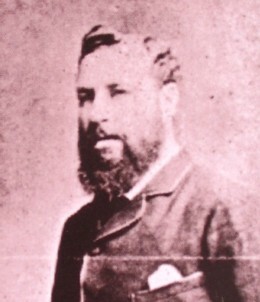 William Ridley, a civil engineer of wide experience in India, Spain, the United States and Mauritius, arrived in the Colony of Natal early in 1876 after having been appointed by the Colonial Office as resident engineer for the construction of a railway from Durban to Pietermaritzburg, with branches north to Verulam and south to Isipingo. Earlier he had been employed on the Great Northern Railways of Colombia, for which he had written a Report on main line of railway and branch cart roads, 1872-1873. During the first half of 1876 Ridley examined the two alternative routes proposed for the railway, one surveyed by Arrot Browning, the other by John Milne*. The hilly terrain posed many problems and led him to remark that "Of the many countries to which my professional duties have led me, Natal, with the exception of Mauritius, presents the greatest height to be overcome within a limited distance of the coast..." (Heydenreych & Martin, 1992, p. 25). He chose Browning's route, to which he made some improvements, because it was less prone to flooding and closer to existing roads. During the building of the railway he recommended that the number of stations along the line be increased from 11 to 20 to accommodate the anticipated traffic, which led to a shortage of funds but proved necessary. Meanwhile it had been decided to extend the railway to Ladysmith and Ridley was instructed to make a preliminary examination of the route. He reported his findings to government in June 1877. A detailed survey then commenced, on which Ridley reported in November 1879. In January 1881 he travelled to England with his documentation to assist the consulting engineer for the project, George Berkley. During his stay in Natal Ridley participated in the evaluation of proposals to improve Durban's water supply and was co-author (with Sir Albert H. Hime) of a Report upon the proposed water supply for the borough of Durban (Durban, 1878, 27p). Heydenreych, H. & Martin, B. The Natal Main Line story. Pretoria: HSRC, 1992.